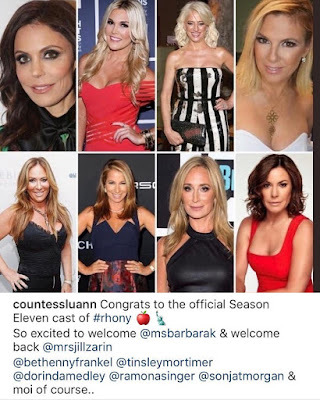 iRealHousewives | The 411 On American + International Real Housewives: Jill Zarin Reportedly ‘Nervous’ About Returning To RHONY For Season 11! According to a new report, Jill Zarin is "nervous" about her return to The Real Housewives of New York City. “Jill Zarin has been busy filming with the ladies of RHONY,”a source told Hollywood Life. Jill Zarin appeared in the first four season of the Bravo hit reality series. She made a guest appearance in Season 9 and Season 10. Last year, Bravo camera captured her late husband, Bobby Zarin, who lost his battle with cancer at his funeral, which and Bethenny Frankel reunited after years of feuding. Zarin was spotted filming alongside returning cast members Sonja Morgan, Ramona Singer and Dorinda Medley. According to a source, Zarin was not only “filming with the girls” at the Angel Ball in New York City on October 22, but she was also taking “directions from the crew and being escorted inside” by production.